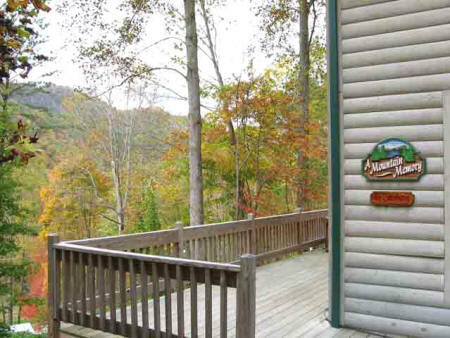 Vacation Cabin for rent near the Nantahala River White Water Rafting. Southwestern North Carolina vacation rentals. Western NC vacation homes and log cabins for rent. Vacation homes for rent in the South West North Carolina Mountains. Cabin rentals on Lake Nantahala and the Nantahala river. Cabins for rent close to the Great Smokey Mountains. Relax... or take advantage of the areas activities and attractions. We are located close to whitewater rafting on the Nantahala River, tubing, the Appalachian Trail, Bartram Trail, the Cherokee Indian Reserve and the Great Smoky Mountains National Park. Go for a swim in Lake Nantahala or Fontana Lake, explore nearby waterfalls, hike Wayah Bald Mountain, fish at the local trout farm or just relax and enjoy the mountain views and scenery. Lake Nantahala Pontoon boats for rent. Nestled in the gated Bear Paw Resort, our full-service marina offers boat rental, long and short term slip rental, gasoline, boat ramp, bait, boating supplies and a full-service grill. Lake Hiwassee is just minutes from the Tennessee and Georgia state lines, centrally located between Chattanooga, Knoxville, Asheville and just 2 hours north of Atlanta. Whether it be a quick day trip or an extended vacation, Lake Hiwassee and Mountain View Marina are a perfect getaway destination. Located in the foothills of the Appalachian Mountains, Lake Hiwassee is one of the most picturesque vacation retreats in the southeast. With most of its 163 miles of shoreline preserved by the Nantahala National Forest, Lake Hiwassee's breathtaking beauty remains unspoiled. Quiet secluded coves and inlets provide excellent opportunities for swimming, boating, fishing, or just relaxing and enjoying the view. From the spring's mountain laurel to the glorious colors of fall, Lake Hiwassee's engaging scenery can be enjoyed year round. Hiawassee. with many great views of the mountains. 1-4 hour trail rides in National Forests Tusquitee Rd. Open April-May & Sept.-October, Friday, Saturday & Sundays 10:am to 5:00pm. Open FULL TIME Memorial Day through Labor Day 9:00am to 6:30pm. Experience the Smokies by horseback. See remnants of an old settlement left behind by the Fontana Dam workers. View Fontana Dam on a two hour ride, four hour and all day trips also available.